I just fulfilled a piece of my childhood ambitions—I applied to be an astronaut! 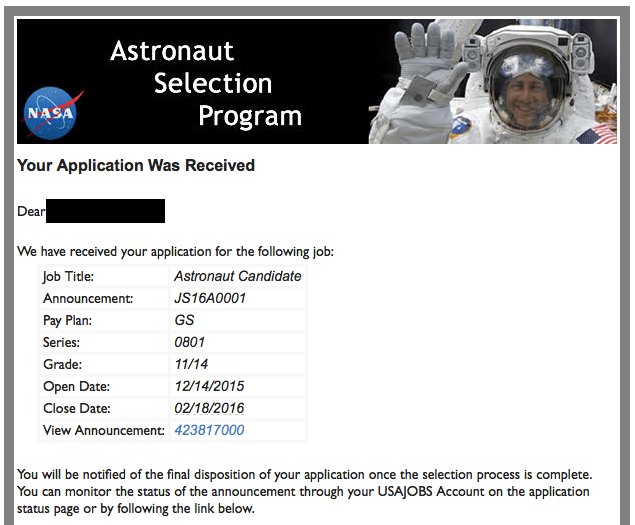 Or more technically, I applied to be an astronaut candidate. (Not all astronaut candidates, who train for several years, are eventually selected to be astronauts). I in no way expect that NASA will actually choose me. For one, although I am technically qualified, I am relatively young and inexperienced for an astronaut candidate, who tend to be in their mid-30s. For two, there’s the whole “we don’t send crazy people into space” thing. Still, when I learned last fall that NASA was going to be accepting astronaut candidate applications again for a short period of time—and that they’d relaxed the requirements for people with poor eyesight—I couldn’t not apply. The application process ended up being a fairly good use of my time. I’ve been meaning to convert my academic C.V. into an industry-ready resume, and this was the push I needed to get started. It turns out that when you define “professional experience” as “things I got paid to do,” I have quite a lot of it! Which was encouraging. It can sometimes feel like grad school has sucked all my life skills away, so I’m glad to know it hasn’t. Anyway, wish me luck! I haven’t the foggiest idea how we’d handle it as a family if by some miraculous chance I was accepted, but that’s not a bridge we need to worry about crossing just now. For the moment, what matters is that I’ve tried.